Steve Jobs once dismissed the Kindle by declaring that “people don’t read anymore.” That may or may not be true, but either way, people definitely still sell books. 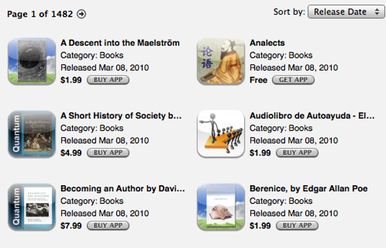 As The Guardian reports, e-books are now more plentiful on the App Store than any other kind of app—including games. Of course, the e-book number gets a bit artificially inflated. For one thing, standalone e-book apps are a bit simpler to create than games. Additionally, we don’t buy a new, custom movie-player for each film we want to watch. The current trend to make custom apps on a book-by-book basis is tiresome: for example, some book apps let you adjust font size, or colors, or lock the screen’s orientation, but there’s little consistency. While apps like Kindle for iPhone and Stanza haven’t curbed the onslaught of standalone e-book apps, perhaps Apple’s forthcoming iBookstore for the iPad will finally do the trick. Whether the iPad will truly compete as an e-book reader, however, remains to be seen.